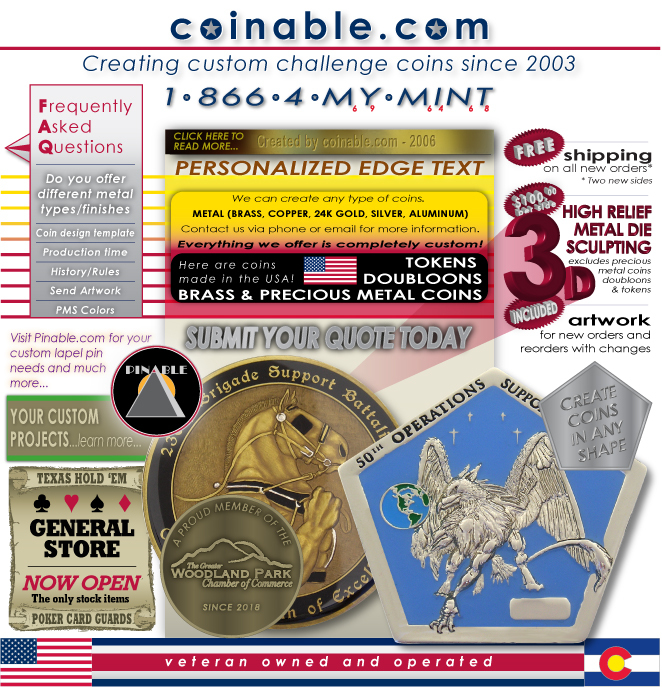 Design, create and make your own custom challenge coins. Challenge coin history World War I challenge coins, military coins, unit coins, custom coins, quality coins, card guard, texas hold em cover, Air Force, Army, Navy, Coast Guard, FBI, Secret Service, CIA, Navy Seals, Delta Force, Rangers, Airborne, Marines, Military, Police, organization, wedding, gift, gifts, fundraiser, novelties, novelty, medal, medals, lapel, pin, pins, personalized, custom, design, recognition, awards, medallions, honor, die-struck, squadron coins, gold, bronze, brass, silver, custom coins, custom coin, custom made, hand made , history, rules, display Coinable.com creates custom coins. Coins can be made from metal, wood, or plastic. We can even create these coins in different shapes and sizes. Let's try to break down the classification of coins: First we have high quality coins, coins made of precious metals that would include .999 fine silver and 24K gold. These coins are highly labor intensive. First as all coin creations, artwork must first be prepared before dies are cut. Yet there are many other processes the artwork will go through before the dies are made. First the colored artwork will be turned into black and white artwork. From this black and white drawing 2D metal or raised metal will be cut into the master die. For 3D or high relief/bas relief a plaster mold is made. This is done by hand using the skills of a master craftsmen. After the plaster cast is created, a rubber invereted mold is made. A plastic resin then fills the rubber mold. After the resin sets it can then be placed on a reducing machine cutting this design into the master die. Once a set of master dies are created one more set is made that is used in production of the precious metal coins. Each coin is struck twice to ensure a mirror proof-like finish. These coins are not colored, just plain metal. Second we have challenge coins. Challenge coins are made in a similar fashion with less labor involved. After the coinable artwork is created, the vector artwork is sent to a die maker. The die making process is all done by hand for challenge coins. From cutting the 3D designs directly into the master mold the the text. Challenge coins are only struck one time. Challenge coins are cheaper to make because they use either brass or copper as a base metal. There are several options to add to the apperance of challenge coins, you can choose different metal finishes: Antique Copper Shiny Copper Antique Bronze Shiny Bronze Antique Silver Shiny Silver Matte Silver Antique Gold Shiny Gold Matte Gold Nickel Matte Nickel Black Nickel Imitation Rhodium Rhodium Next we have different edgings you can add to your challenge coin: Reeded Edge Twist Diamond Cut Edge Flat Diamond Cut Edge Weave Diamond Cut Edge Rope Edge Here are a list of paint features commonly used: Glow Paint Heat Changing Paint Transparent Paint Glitter Paint Pearlescent Paint During World War I, American volunteers from all parts of the country filled the newly formed flying squadrons. Some were wealthy scions attending colleges such as Yale and Harvard who quit in mid-term to join the war. In one squadron a wealthy lieutenant ordered medallions struck in solid bronze carrying the squadron emblem for every member of his squadron. He himself carried his medallion in small leather pouch around his neck. Shortly after acquiring the medallions, the pilot's aircraft was severely damaged by ground fire. He was force to land behind enemy lines and was immediately captured by a German patrol. In order to discourage his escape, the Germans took all of his personal identification except for the small leather pouch around his neck. In the meantime, he was taken to a small French town near the front. Taking advantage of a bombardment that night, he escaped. However, he was without personal identification. He succeeded in avoiding German patrols and reached the front lines. With great difficulty, he crossed no-man's land. Eventually, he stumbled onto a French outpost. Unfortunately, the French in this sector had been plagued by saboteurs. They sometimes masqueraded as civilians and wore civilian clothes. Not recognizing the young pilot's American accent, the French thought him a saboteur and made ready to execute him. Just in time, he remembered his leather pouch containing the medallion. He showed the medallion to his would-be executioners. His French captors recognized the squadron insignia on the medallion and delayed long enough for him to confirm his identity. Instead of shooting him, they gave him a bottle of wine. Back at his squadron, it became a tradition to ensure that all members carried their medallion or coin at all times. This was accomplished through a challenge in the following manner: a challenger would ask to see the coin. If the challenged could not produce his coin, he was required to buy a drink of choice for the member who challenged him. If the challenged member produced his coin, the challenging member was required to pay for the drink. This tradition continued throughout the war and for many years after while surviving members of the squadron were still alive. The fighting men and women of the 48th Intelligence Squadron proudly continue this tradition. Operation Desert Storm Taken from Soldiers Magazine Aug 94 Vol 49, No 8 Story by Maj. Jeanne Fraser Brooks Within days of his liberation from a prisoner of war camp, Sgt. Troy Dunlap received two Iraqi coins from an employee of the hotel where he and the other U.S. POWs were being housed by the Red Cross following their release. "One for you and one for me," he told Maj. Rhonda Cornum who also had been taken prisoner when their UH-60 helicopter was shot down by members of Saddam Hussein's Republican Guard during Operation Desert Storm. "We joked that we could use them like military coins. ... We planned how we would use the Iraqi money to 'coin' our friends when we got back to Fort Rucker," Cornum wrote in her book, "She Went to War." "Coining" is a relatively new U.S. military tradition, but has roots in the Roman Empire, where coins were presented to reward achievements. In the U.S. military, the tradition goes back to the early 1960s. A member of the 11th Special Forces Group took old coins, had them over-stamped with a different emblem, then presented them to unit members, according to Roxanne Merritt, curator of the John F. Kennedy Special Warfare Museum at Fort Bragg, N.C. A former commander of the 10th SFG picked up on the idea, becoming the first to mint a unit coin for a U.S. military unit. The 10th Group remained the only Army unit with its own coin until the mid-1980s, Merritt said, when "an explosion took place and everybody started minting coins." Originally, the coins, which bear the unit crest on the front and whatever design the unit wants on the back, were given out by commanders and sergeants major to recognize outstanding acts performed by soldiers in the course of duty. "They're a real morale booster," said Duvall, "and tell the soldier, 'you're a member of our unit' which builds unit cohesion. The soldiers carry their credit card, driver's license and unit coin - their wallets are permanently deformed." Don Phillips, a former commander of the 20th SFG, designed a coin for his unit and presented it to his soldiers when he retired. "Another unit asked me to make a coin for them, and then another, so I went into business making them," said Phillips. To date, Phillips has made coins for "between 600 and 700 units." The tradition has spread to the other services and is even being adopted by paramilitary units like the U.S. Marshall's SWAT team, according to Phillips. The proliferation of coins and their availability to the general public in post gift shops has caused Dr. Joseph Fisher, Special Operations Command historian, to view them as "not as special as they used to be; there are so many of them out there now." But that doesn't stop Fisher from carrying his with him at all times. Making the coins available for purchase has added yet another dimension to the tradition - collecting. SMA Richard A. Kidd has approximately 300 of the coins on display in his office "museum." He has even issued an open invitation to soldiers visiting the Washington, D.C., area to stop by his office "even when I'm not here" to see his collection of unit memorabilia. According to Phillips, World War II soldiers were given a coin when they mustered out of the service. But it wasn't until the Vietnam era that a "challenge-response" was added to the tradition of giving unit members a coin. The initial challenge was to prove membership in a particular unit by producing the unit coin. That was followed by the addition of the requirement to "buy a round" if a soldier didn't have the coin. "Buying a round isn't the only challenge these days," said Phillips. "Drinking is frowned on, so the challenge can be anything. If you don't have your coin, you get the detail." Kidd still uses the original premise in distributing coins and carries some with him whenever he travels. "It's a way to immediately recognize above-and-beyond - the-call-of-duty actions on the part of a soldier when you're in the field," said Kidd. Boer War in 1899 Some accounts go back to Britain's Boer War in 1899 that brought about the tradition of awarding coins. A "coin check" consists of a challenge and a response. 1. RULES: a. The challenge is initiated by drawing your coin, holding it in the air by whatever means possible and state, scream, shout or otherwise verbally acknowledge that you are initiating a coin check. Another, but less vocal method is to firmly place it on the bar, table, Or floor (this should produce an audible noise which can be easily heard by those being challenged, but try not to leave a permanent imprint). If you accidentally drop your coin and it makes an audible sound upon impact, then you have just "accidentally" initiated a coin check. (This is called paying the price for improper care of your coin." b. The response consists of all those persons being challenged drawing their coin in a like manner (other organizational coins are invalid). You must produce a coin with YOUR UNIT'S LOGO on it. c. If you are challenged and are unable to properly respond, you must buy a round of drinks for the challenger and the group being challenged. d. If everyone being challenged responds in the correct manner, the challenger must buy a round of drinks for all those people he challenged. e. Failure to buy a round is a despicable crime and will require that you turn-in your Coin to the issuing agency. 2. Coin checks are permitted, ANY TIME, ANY PLACE'. (Keep OPSEC in mind, be smart!) 3. There are no exceptions to the rules. They apply to those clothed or unclothed. At the time of the challenge you are permitted one step and an arms reach to locate your coin. If you still cannot reach it -- SORRY ABOUT THAT! 4. A Coin is a coin. Coins attached on belt buckles are considered "belt buckles." Coins on key chains are considered "key chains." Coins placed in a "holder/clasp" and worn around the neck like a necklace are valid and are considered a coin. Your source for Challenge Coins and key chains. 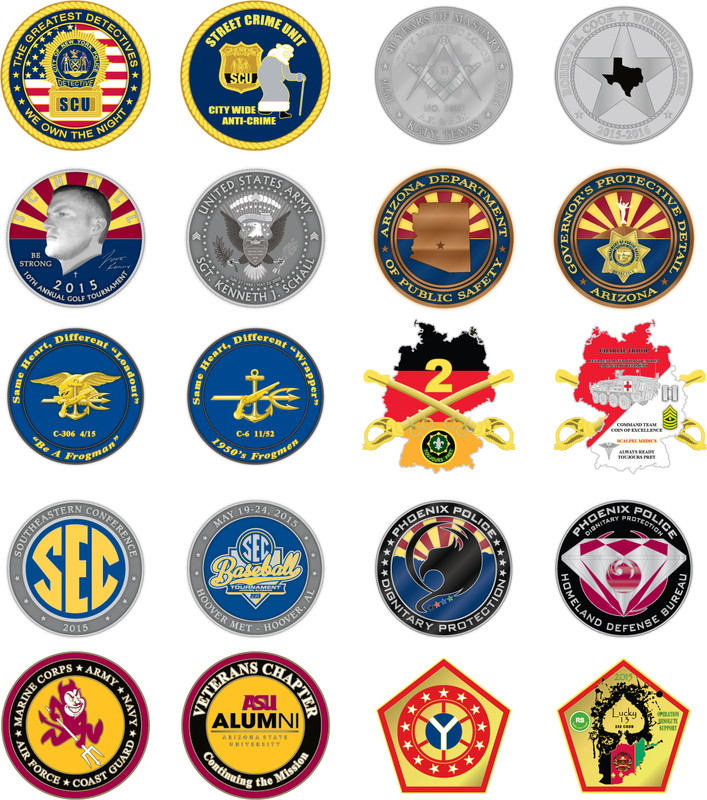 When you need Commemorative Custom Challenge Coins, we are the people to talk to. Military challenge coins are also known as military coins, unit coins, memorial coins, unit challenge coins, or commander's coin. The coin represents affiliation, support or patronage to the organization minted on the coin. The challenge coin is a treasured and respected representation of the organization minted on the coin. Commanders use specially minted military coins to improve morale, foster unit esprit and honor service members for their hard work. For instance, each quarter during a weekend drill, commanders in the 507th Air Refueling Wing, Air Force Reserve, present a Commander?s Coin to unit reservists demonstrating dedication to the Air Force Core Values of Integrity First, Service Before Self, and Excellence in All We Do. On 25 March 2001 NASCAR Winston Cup Series driver Elliott Sadler won the Food City 500 auto race at the Bristol Motor speedway, and said his good luck symbol will now be a four-star general's special bronze coin. The coin Gen. Lester Lyles, Air Force Materiel Command commander, gave him during a visit to the pit area just before the race started proved to be the good luck he needed to take his first victory in 75 starts, Sadler said. Cpl. Stephen M. Roberts, machine gunner, B Co., 2nd Battalion, 187th Inf. Regt., received the battalion commander's coin for actions 19 January 2002 in reporting the activity of six unknown persons who were seen jettisoning from their vehicle to stake out the perimeter. The 187th Infantry Regiment had just replaced the 26th Marine Expeditionary Unit on the perimeter of the Kandahar airport in Afghanistan. The unknown suspects were about 350 meters from the perimeter fence when Roberts spotted them. He called in to the radio telephone operators, or RTOs, who then sent out a patrol. The suspects escaped, but their planned mission was thwarted. Challenge coin rules only apply to other individuals who also have a challenge coin. 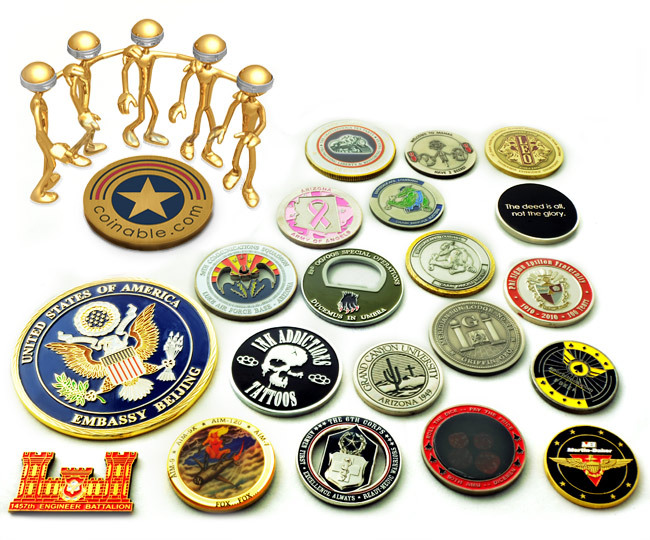 A holder of a challenge coin may "challenge" any individual who is known to have a coin. A challenge is made by withdrawing a coin and raising it in the air or by tapping it on a bar or table. The individual who is challenged is required to produce their coin within 60 seconds. If the individual produces the coin, the challenger is obligated to buy them a drink. If the challenged individual fails to produce the coin, they are obligated to buy the drink. The reward does NOT have to be an alcoholic beverage. It can be a soda or any other reward that the two individuals agree on. If a coin is dropped and it hits the floor, the owner is obligated to buy drinks for anyone who hears or sees the coin hit the floor (provided they have their coin on them). Coin challengers are known to strike anywhere at anytime. They insidiously stalk the challenge, waiting for just the right moment to attack. An innocent bystander may never hear the challenge - only the challengee's despairing cry, "... Ah ____! I forgot mine! According to one story, challenge coins originated during World War I. American volunteers from all parts of the country filled the newly formed flying squadrons. Some were wealthy scions attending colleges such as Yale and Harvard who quit in mid-term to join the war. In one squadron, a wealthy lieutenant ordered medallions struck in solid bronze and presented them to his unit. One young pilot placed the medallion in a small leather pouch that he wore about his neck. Shortly after acquiring the medallions, the pilots? aircraft was severely damaged by ground fire. He was forced to land behind enemy lines and was immediately captured by a German patrol. In order to discourage his escape, the Germans took all of his personal identification except for the small leather pouch around his neck. In the meantime, he was taken to a small French town near the front. Taking advantage of a bombardment that night, he escaped. However, he was without personal identification. He succeeded in avoiding German patrols by donning civilian attire and reached the front lines. With great difficulty, he crossed no-man's land. Eventually, he stumbled onto a French outpost. Unfortunately, saboteurs had plagued the French in the sector. They sometimes masqueraded as civilians and wore civilian clothes. Not recognizing the young pilot's American accent, the French thought him to be a saboteur and made ready to execute him. He had no identification to prove his allegiance, but he did have his leather pouch containing the medallion. He showed the medallion to his would-be executioners and one of his French captors recognized the squadron insignia on the medallion. They delayed his execution long enough for him to confirm his identity. Instead of shooting him they gave him a bottle of wine. Back at his squadron, it became tradition to ensure that all members carried their medallion or coin at all times. This was accomplished through challenge in the following manner - a challenger would ask to see the medallion. If the challenged could not produce a medallion, they were required to buy a drink of choice for the member who challenged them. If the challenged member produced a medallion, then the challenging member was required to pay for the drink. This tradition continued on throughout the war and for many years after the war while surviving members of the squadron were still alive. According to another story, challenge coins originaged during the Vietnam War. Leisure time in Vietnam was a commodity, but when it came, it was utilized to the max; catching up on sleep; writing letters home; letting off steam at the hooch bar. The latter provided to be most popular, but eventually it too could become boring and mundane. To heighten excitement and foster unit esprit de corps, Bullet Clubs were formed. These were comprised of small, elite, front-line fighters who each carried a personalized bullet from the weapons they carried in combat. The ultimate use of the bullet, usually carried in a hip pocket, was to deny the enemy personal capture. When an individual entered the Hooch Bar, he would be challenged by fellow team members to produce his bullet. If he did, the challengers would pay his bar tab for the rest of the evening. If he failed to produce his bullet, he bought the drinks for all the remainder of the night. Eventually, personalized bullets took on disbelieving proportions. Some "teamies" took to carrying 20-, 40-, or 105mm cannon shells. Clearly, these were not personalized coup de grace munitions but rather manifestations of perceived individual prowess in combat or - perhaps - on R and R. At the height of the Bullet Club's heyday, it was not an uncommon sight to see strewn across a barroom table a very respectful representation of the full range of bullets, rockets, cannon and artillery shells used in Southeast Asia. In order to gain control of the situation - and to avoid accidental discharge of the large, fully functional munitions - bullets were traded for coins which reflected the unit's symbol and pride. Each coin was personalized by a controlled number and/or the individual's name. The rules remained the same, although today they are greatly expanded. Loss of one's coins was and remains tantamount to eternal disgrace and banishment. To forget to carry one's coin in anticipation of a challenge results in a minor death. 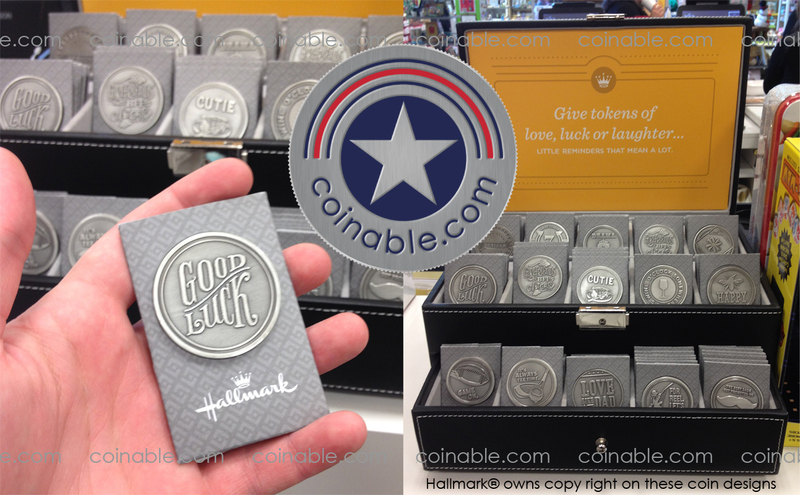 coinable.com is not affiliated with the Department of Defense or any Military Service. Military Service.